Toronto Dogs Directory: Is Your Dog Constantly Coughing? It Might Be Kennel Cough, So Know The Symptoms! Is Your Dog Constantly Coughing? It Might Be Kennel Cough, So Know The Symptoms! Kennel cough in dogs is a very common and contagious disease. It can be compared to a human flu because your dog’s immune system is attacked by a mix of bacteria and viruses at the same time. In most cases, kennel cough is not serious, and should only last a few weeks. However, in more serious cases, it can last up to several months. It is important to know what to look for when dealing with kennel cough so you can provide the best treatment for your dog. This is especially important in young puppies and small dogs. Puppies and small breed dogs are much more vulnerable when it comes to kennel cough and respiratory diseases. Although it is rare, sometimes kennel cough can cause permanent damage to the trachea. Cough. This is the most common symptom of kennel cough. It is a persistent, dry, hacking noise that sounds like your dog is about to vomit. It is common for your dog to cough many times in succession with the final cough looking and sounding like your dog is trying to cough something up. Exercise. Most dogs will still be active and act normal while they have kennel cough. However, if you notice your dog coughing and hacking which becomes worse every time you are on a walk or run, it is likely your dog has kennel cough. Phlegm and Foamy Liquid. Coughing up phlegm is a very common symptom of kennel cough. It is possible your dog may throw up small amounts of clear liquid or foam due to an irritated throat. Some dogs will not cough anything up, but it is important to remember that the coughing and hacking still affects your dog’s throat. Lethargy and Depression. Depending on the severity of kennel cough, it may start to wear your dog down. It is important to monitor your dog closely if he starts acting different and sleeping more. Other minor symptoms of kennel cough include runny nose, discharge of the eyes and loss of appetite. - Kennel Cough vaccine: This can come in the form of a shot or an inhalant. Some dog owners have reported the vaccine brings on a case of kennel cough, so it is recommended only getting this vaccine for dogs who spend a lot of time around other dogs, such as show dogs or dogs who frequent the dog park. - Antibiotics: Your veterinarian will prescribe antibiotics to help fight the virus. Antibiotics also help to prevent secondary infections while your dog’s immune system is weakened. Your vet will prescribe the best antibiotics suited for your dog based on symptoms, age, breed and weight. - Cough suppressants: These will help to soothe your dog’s throat and ease the coughing. Always check with your vet before purchasing over the counter medications for coughs. They can better recommend type and dosage for your dog’s case of kennel cough. Be sure to use these in minimal amounts. - Anti-inflammatory medications: Your vet may prescribe anti-inflammatory medications such as terbutaline sulfate if your dog is having trouble breathing. Anti-inflammatory medications help to open up the air pipes in your dog and can be very beneficial for treating kennel cough. 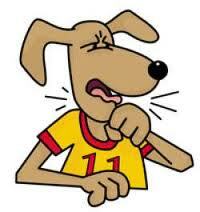 If you suspect your dog may have kennel cough, always take him to the veterinarian for proper diagnosis and treatment.